The confessions of Waghmare stated in the SIT report not only show the intention behind killing Lankesh, but also make it clear that there is a machinery functioning behind these planned killings of anti-Hindutva voices. On September 5, 2017, Gauri Lankesh, an activist-journalist was assassinated in Bengaluru. Her journalism that focused on unveiling communal, non-secular agenda of the right wing, costed her life. 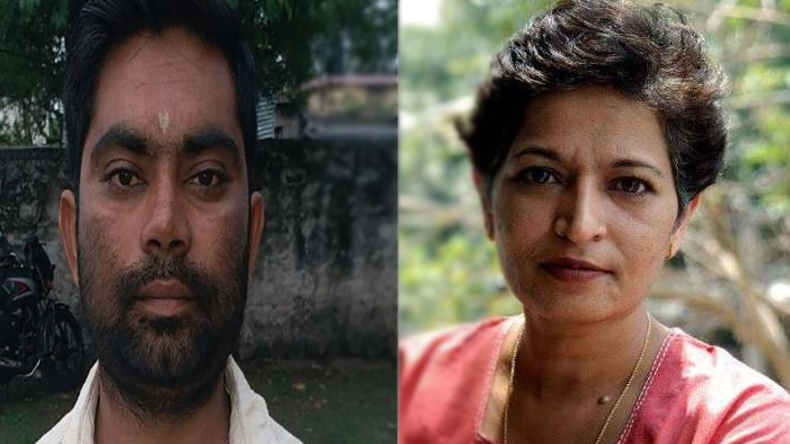 Parashuram Waghmare, who was arrested by the Special Investigation Team (SIT), has confessed to have assassinated the journalist to “save Hinduism”. The SIT had earlier arrested five people – K.T. Naveen Kumar alias Hotte Manja, Amol Kale, Manohar Edve, Sujeeth Kumar alias Praveen and Amit Degvekar. All the six arrested related to case are the suspected assassins and one of them, Waghmare has confessed. However, his confession doesn’t answer an important question: who is the mastermind behind the assassination? The confessions of Waghmare stated in the SIT report not only show the intention behind killing her, but also make it clear that there is a machinery functioning behind these planned killings of anti-Hindutva voices. The recent statement of an unnamed official belonging to the SIT brings to light the existence of a gang of the hardline Hindutva recruits functioning in five states: Madhya Pradesh, Gujarat, Maharashtra, Goa and Karnataka. The same official is reported to have said that this “unnamed organisation/gang” comprises at least 60 people and although it has “recruited people from hardline Hindutva organisations like Maharashtra-based Hindu Jagruti Samiti and Sanatan Sanstha, these outfits may not be directly responsible for the killings”. The above mentioned official, however, has not provided any explanation for the non-involvement of these Hindutva organisations. Sri Rama Sene, a right wing Hindu fundamentalist organisation is fundraising to support the family of Waghmare, who according to the organisation, is a patriot. The earlier reports had established that Waghmare is Sene’s activist. Pramod Muthalik, the supremo of the Sene has denied this, however, he has admitted that Waghmare was with the RSS till 2012. In this case, how can one conclude that the Hindutva organisations are not responsible for these killings? Why has the police failed to track down this “unnamed organisation”? It is not only the investigation in the case of Gauri Lankesh, but the earlier cases of Narendra Dabholkar (2013), Govind Pansare (2015) and M M Kalburgi (2015), yield the same question. Is this question been pursued in the investigations at all? The investigations so far have stopped after arresting the suspected assassins. No efforts have been made to reach the brain behind these well-planned attacks. Dr. Narendra Dabholkar, a rationalist and an anti-superstition activist, who had founded the Maharashtra Andhashraddha Nirmoolan Samiti, was shot dead on August 20, 2013. On August 29, 2013, a Sanatan Sanstha worker was arrested by the police from Goa as part of its probe. The organisation claimed that even though it had differences with Dabholkar, they had no reason to kill him. Following a PIL filed by journalist Ketan Tirodkar, the CBI had taken over this case in May 2014 on the directions of the Bombay High Court. In May 2016, Virendra Tawade of Hindu Janajagruti Samiti was arrested in connection with the case. Govind Pansare was attacked by two unidentified gunmen in Kolhapur, on February 16, 2015. He died on February 20. Pansare was a member of the Communist Party of India and a supporter of Dabholkar’s movement. He was a vehement critique of the Hindutva organisations. An SIT had implicated Virendra Tawde, Sarang Akolkar and Vinay Pawar – suspects in the Dabholkar murder case – in the Pansare case as well, in 2016. Here too, Tawade was named as a key conspirator, and Akolkar and Pawar were suspected of firing at Pansare. However Tawade was granted bail by the Kolhapur court in 2018. M M Kalburgi was assassinated on August 30, 2015 in Dharwad, Karnataka. A rationalist, scholar and a teacher was shot dead in his own house. Unlike in the cases of Dabholkar, Pansare and Lankesh, the case of Kalburgi is still a mystery, with no arrests. Uma Devi Kalburgi, the wife of Kalburgi, has appealed to the Supreme Court to hand over the case to an SIT. During the hearing, the Centre had told the Supreme Court that it did not want to hand over the inquiry to the National Investigation Agency. It said the crime was not a “scheduled offence” under the NIA Act. Investigations in all the three cases have not convicted anyone, let alone getting to the mastermind behind these killings. The SIT report in Gauri’s case, has raised new questions and is demonstrating the link between all the four killings. "Two murders happened in Karnataka and two happened in Maharashtra during the Congress regime. No one is uttering a word over Congress government's failure. Instead, they are asking why PM Modi is silent and not commenting on Gauri Lankesh's death. Many wanted PM Modi to react after Lankesh's death. Why should PM react if some dog dies in Karnataka?" It is high time that the PM Modi breaks his silence regarding the murders of the rationalists, scholars, and activists of the country that he is the elected PM of. It has been established that the arrested six are affiliated to a Hindutva organisation. Going by what the SIT official has said, isn’t it suitable to investigate the Hindutva organisations’ operations – not only in Karnataka but the whole country? As it also has been established that there are 60 people recruited from various Hindutva organisations, and they are functional, it is even more crucial that these organisations are investigated. Is it not a good enough reason for the BJP-led central government, headed by PM Modi? Waghmare has confessed that he was approached by someone with the intention to kill Gauri Lankesh to save Hinduism and that he killed her because of her “anti-Hindu” speeches. All the six arrested in the case of Lankesh have been charged under section 302 (murder), 120B (criminal conspiracy), 118 (concealing a conspiracy) and 114 (abetment to the crime) of the IPC, and also under provisions of the Arms Act. Approaching these ideologically motivated killings as mere murders is the main problem; and is the main obstacle to get to the mastermind behind these murders. The SIT has said, that these accused are part of the Hindutva organisation, but yet why are these organisations being kept away from the investigations?